The problem with air travel is the fact that no two airports are the same. Some airports offer you an amazing cornucopia of experiences including High Street fashion shopping and gourmet meals (I'm thinking Hong Kong International Airport), while others are seriously basic and there's not much to do once you're airside, other than to sit with the rest of the cattle and wait/hope for your flight to board before your sanity departs first (like Kigali airport). However, no matter how barren or basic the airport may seem, knowing some of the ins and outs can make your transit experience a heck of a lot more pleasant. Naturally, our focus is on food; but one must have a comfortable environment in order to enjoy one's food, so we need to try to achieve that too! The second airport to be reviewed in this mini-series of articles is O.R. Tambo International Airport in Johannesburg, South Africa (the first was of course Hong Kong International Airport, although I didn't know it at the time ...). I would consider this the most modern and impressive airport in Africa (although on a global basis, I still believe that Hong Kong and Singapore airports are the true stand-outs from an overall perspective - comfort, amenity, service, food, shopping, etc). The airside self-service restaurant is simply a nice looking cafeteria, so your expectations need to be set at that level. However, if you have enough time to kill, I would recommend going out through customs to spend some time in the landside part of the airport. Since I had about 5 hours between flights, I did just that. The only catch you need to think about arises if you don't already have a boarding pass for the next flight. The landside check-in queue can be insanely long and slow - I once queued for an hour! And they have dedicated ground crew stationed at the start of the queue whose sole job is to weigh your carry on luggage. The official limit is 7 or 8kg, I think, but they have discretion to let you get away with up to 10kg if you do some sweet-talking. But if you've managed to squeeze your 15kg gold-bullion filled carry-on at the previous airport, you're not going to get it through at this airport! There is an entire massive level set between the arrivals and departures levels, which is devoted to restaurants. Most of these restaurants are your typical African chain restaurants and fast food joints, like Wimpy's, Ocean Basket, Soaring Eagle Spur and even KFC. There is even a pub - the Keg and Aviator - for those who feel the need for a cold one. One of the better restaurants, in my view, is Mugg and Bean, which is a prolific chain restaurant that has outlets in many African nations. It's not a full blown restaurant or a bistro, but more of a coffee and brunch place, serving breakfast and light meals. Which is of course perfect for air travel - when was the last time you enjoyed a plane ride while bloated with food? Despite the huge number of staff, the service can be patchy. The best policy is to directly approach a member of staff to tell them where you're sitting, and that you'd like to order some food (don't worry, they'll give you a few minutes before they come to take your order). It's much better than sitting quietly at a table unannounced, and then getting upset that nobody has bothered to come take your order. I noticed a few people doing this, which eventually led to hand-waving and the making of remarks at the staff which would only have guaranteed the chef's surprise with their meal - even a couple of locals. I mean, seriously, shouldn't you know better?! But when they arrive, don't make the beginner's mistake of asking them to come back in a few minutes, because a few minutes will turn into half an hour. Think of it as an exam. Discipline yourself to decide what you want to eat very quickly, then when time's up, put your pens down, order something, and hope that it's what you wanted. Better than going hungry. The same applies when they come back again and ask you if you want another coffee. That said, the staff are pleasant and friendly. You may wonder why I didn't just eat the breakfast served on the plane? 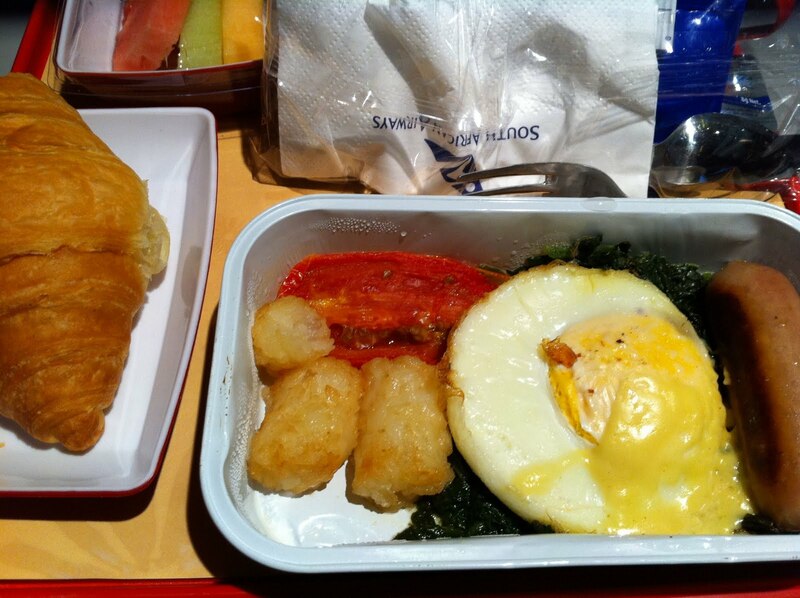 As you can see from the picture, economy class airline caterers cook eggs like the way they cook fish. After a tentative mouthful, I decided to leave the egg to bask alone in its rubbery glory. And the croissant promised much, but turned out to be a dry normal airline bun in a different guise. The fruit was nice and fresh, though, but hardly filling on its own. So it's a good thing O.R. 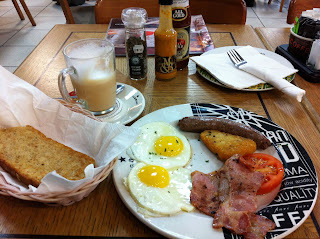 Tambo International Airport has something much more palatable to offer on the landside. Post note: Ah yes, I forgot to mention - O.R. Tambo International Airport in Johannesburg is perhaps the only airport I know of that still has an express massage (totally legit - not the dodgey kind!) outlet airside. For the bargain price of R180, you can get a 20 minute leg massage to minimise your DVT risk. Or even a neck, back and shoulder massage. But I reckon the leg massage is the best. Do yourself a favour and set aside the time to give it a go!